▪ Brazilian police arrested a horse for kicking a car and put the animal in jail. The horse, named Faceiro, was startled by the car as it passed and kicked it, causing damage. 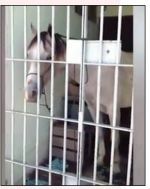 Police took the horse into custody and locked him up for 24 hours, until his owner, William dos Santos, agreed to pay for the vehicle damage. “I found my horse in a jail cell as if he were a common criminal,” dos Santos said. Police said they had launched an investigation into the incident. “It is not normal to arrest a horse,” said the police chief.